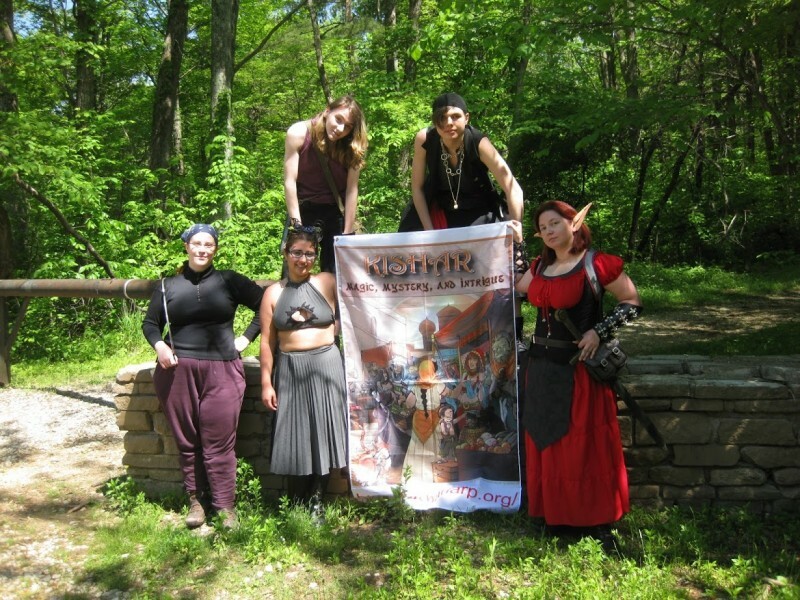 You might have noticed from my post in March that I started LARPing recently, and oh how fun it is – it’s like Gen Con meets summer camp! It really is. There were two big things that were a little intimidating to me as I got started, though: costuming and fighting. Fighting is something I can probably get better at with practice, but costuming? Most of the costumes I have in my closet are either My Little Pony, steampunk, or renaissance faire appropriate – and Kishar has an Asian/Arabian Nights mix of costuming and setting – how do I get myself costumed for this? And how do I get myself costumed in a way that everyone’s not going to look at me with pity because I’m a newbie who has no idea what she’s doing? I’m so used to just regular cosplay – I’ve got a character that I can then make a costume for, whether it’s an existing outfit that a character’s established as something they wear, or something inspired by a character (like Pinkie Pie – she doesn’t often wear clothes, heh.) Starting from scratch was intimidating as all heck. I ended up tackling this in a couple of steps, once I got over being so overwhelmed by the daunting prospect of not only creating a character, but costuming one too. The first thing I did: asked for help. Lots of it. J and Kasi were extremely helpful in determining what would make good costume pieces, but then again, since they run the game, they know what’s good for costuming! Next: I cruised Amazon, Etsy, and other places to find things that I might not be able to make on my own, like elf ears. There’s a lot of places out there where you can buy LARP gear – and again, I asked J and Kasi for suggestions on where to shop, so I made sure I was getting quality stuff. After that: I dug through my existing costuming to see what would work. The results: a fair bit of my costuming was easily repurposable for my character’s costume. Even stuff I didn’t initially think would be good, like some of my steampunk stuff (the little bag I showed off in this post about my steampunk gear works crazily well!) and a lovely bag my mom-in-law bought me for my birthday, ended up being pulled in as costuming bits. Lastly: I made some stuff. (I mean, come on, I’m The Crafty Nerd, after all!) like my spell packet bag (which is ugly but functional) and my overdress bits (unsure what to call them, but we’ll stick with overdress). And as I went through all that, I started to come up with a fair idea of what I wanted to wear. one: it had to look good. I didn’t want to be the one awkwardly dressed noob at my first game. two: it had to be somewhat comfortable. I’d be wearing this for hours, likely, while walking through the forest. With those three things in mind, and a giant list of ideas added to my Amazon Wishlist, I ended up emerging with two costumes – one of which I wore to my first game! I’m the one with the SUPER OBVIOUS elf ears, borrowed for the game. I now have a pair of more subtle ones, aheheh. I ended up deciding on two main costume styles: one with a dress, one with pants. The dress, obviously: I chose this because it was light, flowy, and would probably make it so I don’t overheat while playing outdoors. Plus, it was easy to alter to make it shorter, so I wasn’t tripping over it – I ended up taking off the bottom tier of the dress, because I’m short. Corset vest: wanted some sort of corset, but wasn’t sure I’d want one that was super-sturdily boned – turns out this one is a little long for me, but I was able to get some corsets from Kasi that work that I can also wear with this dress! Overdress bits: I made these myself, they’re the black pieces in the photo above that look like they’re extending from the corset. I thought it’d make a nice touch to a fantasy costume – and it’s a work in progress, as I might add some embellishments to it such as embroidery. Leggings under the dress: gotta keep my legs covered, because poison ivy/ticks/brambles are no fun. These were a pair I’ve had hanging around for years. Boots: My good ol’ scooter boots. They handle tromping around in the forest pretty well. Harem pants: oh lord these are comfy. They haven’t made it out to an official game yet, but I bet these’ll be fantastic for running in. And they’re light, too, so I won’t overheat in them. Scarf: this can be used as a belt, or a wrap, or to keep one’s hair back – the uses are endless! love how versatile this is. Corset: planning on using one of the corsets I got from Kasi. Shirt: I have a couple options here: a peasant shirt I made myself, or a peasant shirt I got from Kasi, or I could even use a tanktop if I wanted! Kimono top: light, breezy, and setting-appropriate. I can wear the scarf as a belt over it, or wear it loose over a costume. So there you go! For someone who’s never really done a LARP before, once I figured out how to get started, it was really easy to try and find costume pieces that were readily available, so I’ve got something to wear while I try and craft my own stuff from scratch! Hopefully this will help out other new LARP players as you get geared up for your first game!